In the last few years, I've been mourning the loss of the great American "French fry." Regarding the apparent oxymoron in the previous sentence, I feel that while the fries may be French (Pommes Frites), it was America that made them great. To me, the ultimate in fry perfection is the classic McDonald's fries, which were available in small (white paper) and large (red/yellow cardboard) sizes. They went through the Super-Size trend a few years back, and the recipe has changed slightly since their salad days back in the 1980s (they no longer add beef fat to the frying fat and use chemical tricks to make up for the differing taste), but they have mostly retained the taste that most Americans associate with what a fry is and should be. Technically, the fries at McDonald's are "shoestrings," thinly cut and quickly fried. Variations on the theme include steak fries (a "meatier" fry cut very thick), potato wedges, and the crinkle cut. Curly fries are popular nowadays, and there are variations that do or do not leave the skin on. I'll leave out "home fries" and things like "Tater Tots" as interesting side trips. I'll also leave the British-style "chips" to some future article. I won't even bother with "Freedom Fries." To my taste, fries should be cut potatoes that are fried in hot oil with some salt added for seasoning. 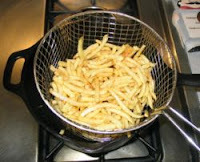 Additional seasonings, such as black pepper, garlic powder, onion powder, and paprika may be added to the salt, to give a more "seasoned" fry. Lately, though, a monster has raised its ugly head. Some food distributors (Ore Ida, I'm looking at you, but you're not alone!) have decided to try to improve upon the simple French fry. Instead of the simple recipe I outlined above "as God intended French fries to be," they decided that fries, for some reason, need to be coated with a batter or breading and additional spices prior to frying. This may make a "crunchier" fry, but to my taste, these are an abomination! Apparently, the packagers decided that pre-cut potatoes weren't simple enough. "Let's add some crap to these things to make them taste better!" they might have said. Unfortunately, the person that added these horrid ingredients apparently had no sense of taste at all. I know that I'm probably not alone in my detestation of these phony fries, but I fear that people don't complain about the monstrosities when they get them. Perhaps people think that restaurant owners don't like feedback on their food servings. To all you restauranteurs, I ask you: How much time and effort is saved by choosing a packaged, frozen, and pre-battered plague than it is to simple use a French fry press on some fresh potatoes? A single potato provides about a single serving... one press of the device and you'll never have your customers declaring your fries unfit for eating! If you want variety, use a mandolin slicer with a very thin blade to make some yummy "home made" potato chips... like T-Bones in Salem, NH. Not only does T-Bones have those wonderful chips, but they serve real French fries! (Kudos to T-Bones, and one word: yummy!). Another restaurant chain with impeccable fries is—surprise!—Ruth's Chris Steak House. Now, the first thing you need to know about this place is that it's expensive. Aside from that, their menu shows that they are very serious about their food. One way that shows this is that they have a whole section of the menu dedicated just to potatoes to accompany your meal: Mashed, Baked, Au Gratin, Steak Fries, Julienne ("regular cut" French fries), Shoestring (very thinly cut), Lyonnaise (sauteéd with onions), and a "Sweet Potato Casserole." By far, my favorite is the Shoestring, which are cut very thin (like a real shoelace! ), served very crispy, and seasoned lightly with salt. When I took Sandra to Ruth's Chris on our second honeymoon in Cancun, she loved the shoestrings as much as I did! Wonderful stuff! I don't believe that any of the potatoes served at this chain are pre-battered, and while the prices are higher at Ruth's Chris than most restaurants that I frequent, their attitude toward potatoes shows a wonderful "let's serve good food" feeling which is probably why people like going there on special occasions. So, although I know it's possible for a restaurant—even a chain!—to have real French fries, I realize that I'm probably on a useless crusade, like Don Quixote tilting at the windmills, but without Picasso around to draw my picture. Nevertheless, I'll continue it. McDonald's still has their classic-tasting fry (they use chemicals to get the near-classic taste, but at least they seem to care what they taste like). Burger King, on the other hand, uses the battered wickedness instead. If it comes to a decision between BK and McD's, my preference is usually Mickey D's, solely because of the fries. Yeah, the burgers aren't flame broiled, but their fries are at least edible! Of course, my Cockney friends seem to feel as horrified at the American version of "chips" as I do about those pre-breaded imposters, but again... that's for a future article.